The John Howard Society of Manitoba estimates Canadians will pay $2 billion annually to cover the costs of Stephen Harper’s omnibus crime bill. Bill C-10, which calls for mandatory minimum sentences for a wide range of crimes regardless of individual circumstances, will trigger a huge increase in the number of inmates and a requirement to build new prisons. It will do nothing to address the root causes of crime, nor will it lead to the rehabilitation of offenders. Given the onerous cost, most of which will be borne by the provinces, it’s not surprising that the provincial governments of Quebec, Ontario and Newfoundland & Labrador have spoken out against the bill. 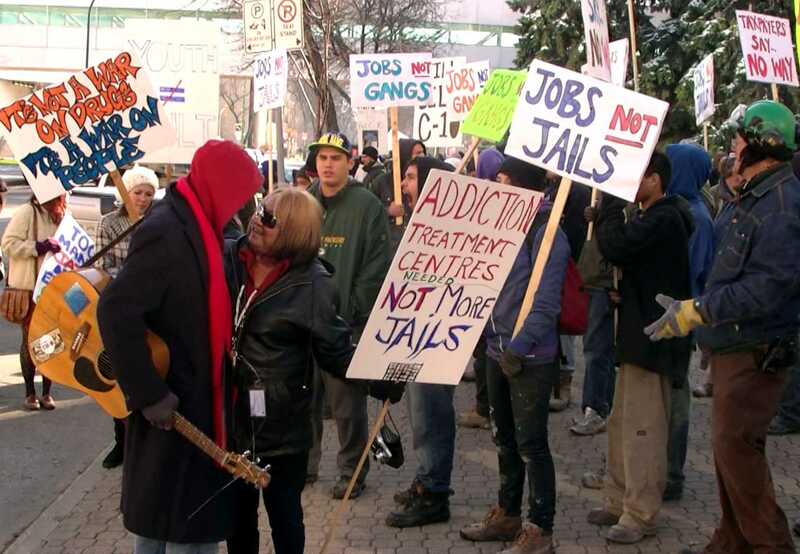 In Winnipeg, the John Howard Society and 13 other agencies held a rally, Nov. 8, to tell the government of Manitoba to do likewise. I recorded the event and will be producing a program for WCTV in the near future. But in the meantime, here’s a short interview with the executive director of the John Howard Society of Manitoba, John Hutton, in which he outlines some of the major problems with the legislation.